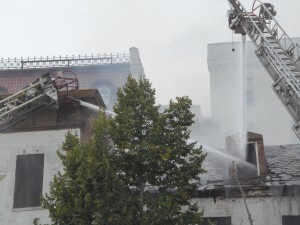 Fire broke out today around noon along the 500 block of North Howard Street at the site of the long shuttered Mayfair Theatre. With two alarms sounding, more than twenty pieces of equipment responded to the scene at the corner of North Howard and West Franklin Streets. 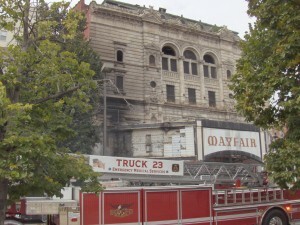 Affected by the blaze were the Mayfair, along with two adjoining buildings which once housed the former Franklin-Delphi Hotel. The fire shut down northbound traffic on Howard Street from Mulberry to Centre Streets, and westbound traffic on West Franklin Street from Park Avenue to Eutaw Street. Light rail traffic along the Howard Street corridor was also interrupted. As a result, the MTA is offering shuttle bus service to accommodate passengers between North Avenue and Hamburg station. Fire officials on the scene could not confirm what started the blaze, but it is believed construction crews working with a welding torch may have accidentally set it off. The Mayfair – a single screen 850 seat venue – was built in 1880. The once popular house was closed in 1986. A roof collapse in 1998 exposed the decaying interior to the elements, but the stately facade remained virtually unaffected. Light-rail travelers may recall that for years the marquee of the Mayfair featured a colorful placard which read: Tonight – Sonny Til and The Orioles. 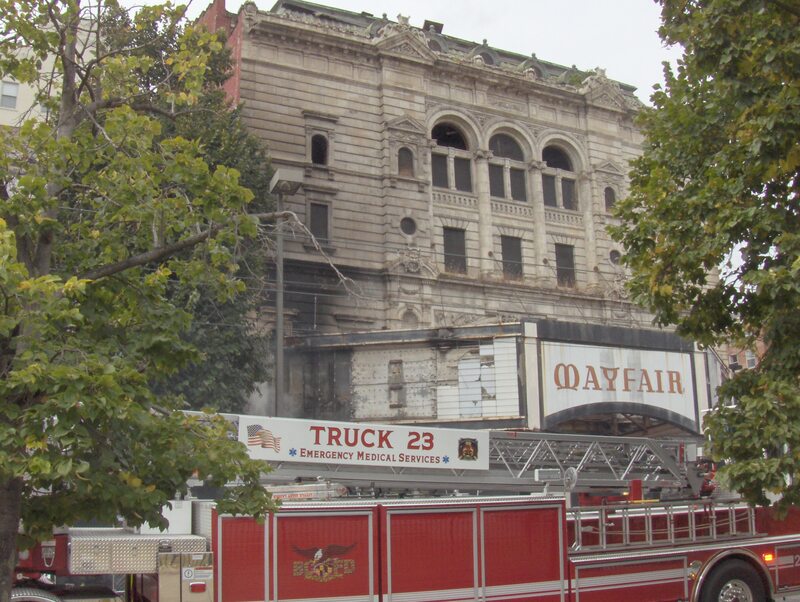 The Mayfair was recently recognized as a Maryland Historic Landmark. The long defunct Franklin-Delphi Hotel was once a welcome stop for weary travelers back in the day when Franklin Street (U.S. 40) was still a main thoroughfare. The hotel was noted for its extensive display of postcards celebrating sites around the Baltimore area. Used to work at the Sunpapers, near there. Shopped at Christmas when a little girl with mom on Howard St. They had great window displays. Probably would not know the area now. Nice memories. Quite a coincidence about the fire. Good work Tony! That’s just about across the street from H&H Surplus, which has to be the worst fire hazard in the city.